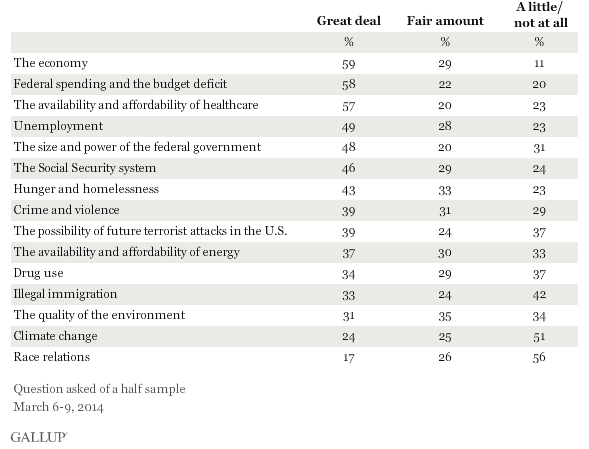 If you listen to Obama, the Democrats and their propagandists in the corporate media, climate change, immigration, and terrorism are top concerns for Americans. A recent Gallup poll, however, paints a different picture. Climate change comes in second to last as a national problem, according to a survey conducted between March 6-9. Race relations lands at the dead bottom of the list. Immigration is near the bottom, followed by environmental concerns. Not surprisingly, most Americans are primarily worried about a dismal economy which, according to the establishment media, is on the rebound. Nearly 60 percent of Americans rate the economy as the problem they are most concerned about. 58% say they worry a “great deal” about out of control federal spending and the budget deficit which, according to Obama and the Democrats last year, was a phantom issue cooked up by a crazed tea party faction in Congress to derail government healthcare at gunpoint. Nearly as many people are worried about healthcare, according to the poll. If, indeed, Obamacare was the cure for the nation’s broken healthcare system this would not rate as a serious problem. Obviously, millions of Americans understand Obamacare is not a solution but in fact exacerbates the problem. Americans are also concerned about a gargantuan government and the authoritarian power it increasingly wields. Social Security, hunger, homelessness, crime and violence also overshadow immigration, the drug war, climate change and race relations in the poll. Despite the poll results, the corporate media, led by MSNBC or CNN, continue to blather on about race and climate change. This is done not because these government propaganda organs are clueless, but rather as a diversionary tactic to steer Americans away from the real problems they face. Out in the hinterland beyond Disneyland on the Potomac, however, Americans are concerned about the real problems facing the nation, although many are only dimly aware of the cause – economic sabotage by the global financial elite as they take down the engine of prosperity and the unprecedented growth of government which has fashioned an authoritarian surveillance and control grid to defeat any and all resistance.